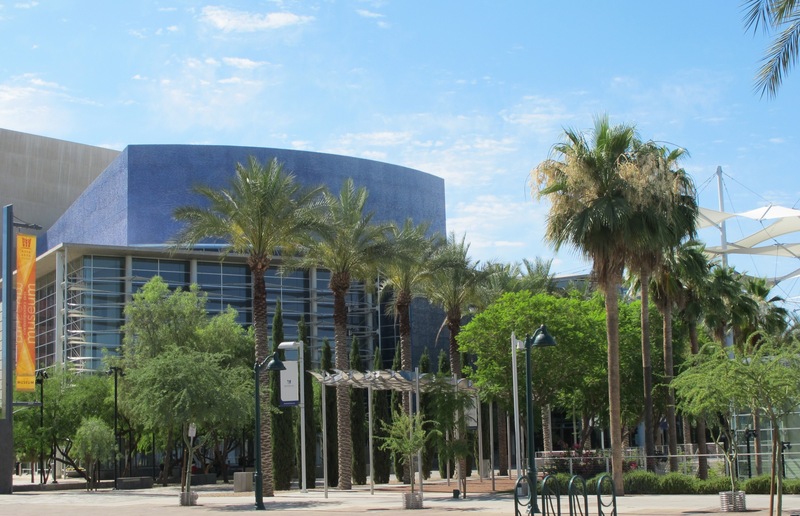 The City of Mesa has long been one of the fastest growing areas of Arizona, with a growth rate of 35.5 percent in the decade between 1990 and 2000; a growth rate of 16.5 percent between 2000 and 2010, and a projected growth rate of about 9.75 percent between 2010 and 2015. The projected population of Mesa by 2015 should be in the neighborhood of 507,000, according to official figures. That said, while Mesa is the third largest city in the state of Arizona, it remains a suburb of Phoenix — a sort of big city near a bigger city, but with the look, feel and amenities of an upscale suburban community. Some of the older neighborhoods in Mesa offer what many call historical diversity, with eight properties being on the National Register of Historic Places. Five neighborhoods – Evergreen, Glenwood/Wilbur, Robson and West Second Street — are also local historic districts. There are also plenty of modern master-planned neighborhoods like Augusta Ranch, Boulder Mountain, Las Sendas, Madrid, and Superstition Springs. What has attracted so many people to Mesa? The answers have to do with the work that city planners have put into designing a city where people actively live and play, with an emphasis on the environment and sustainability. For starters, there are 56 parks in close proximity to most homes and neighborhoods offering playgrounds, baseball/softball diamonds, soccer fields, and basketball and volleyball courts. There are 12 swimming pools and 14 golf courses that are renowned as some of the best in the state. Mesa is also the home training grounds for the Chicago Cubs professional baseball team. Spring training hotel packages are hot with fans from out of town, and with Cactus League play, baseball fans of all persuasions can take in more than 200 professional baseball games in 30 days. Add to this the close proximity to activities such as horseback riding, hiking, bicycling, hot air ballooning — and even learning the history and culture of the area at one of the local museums or art centers. Mesa is known for its active nightlife and dining scene that features cuisines ranging from classic American to Mexican and Southwestern dishes — and a lot more. A hungry diner can even find an array of choices including Indian, Mediterranean, Middle Eastern, Asian, Italian and Greek restaurants in downtown Mesa. Those looking for food and entertainment will find it at one of the several Dinner Theatres in downtown Mesa, or at any of the Sports Bars. There are numerous opportunities for shoppers in Mesa, with a variety of upscale shops and malls to choose from. The Village Square at Dana Park is a 400,000 square foot fashion-oriented mall that features upscale stores mixed with gourmet restaurants, including Coldwater Creek, Chico's, Ann Taylor Loft, White House/Black Market, Barnes & Noble, AJ's Fine Foods, and Pei Wei Asian Cuisine. More than 150 stores including Macy’s and JC Penney make up Superstition Springs Center, a one-stop shopping destination for families in the area. Those looking to spend their money with local merchants should frequent Power Square Mall, where 30 local businesses ranging from health and beauty stores to gift and boutique shops can be found. There is no lack of things to do in Mesa given offerings by the city’s Parks and Recreation department. With 56 parks, 14 recreation and sports facilities, and 12 swimming pools, kids and adults find plenty to keep busy all year round. Adult sports like softball, flag football, kickball and volleyball are offered, as well as swimming lessons for kids, and swimming and diving lessons for adults. Parks and Rec also provides programs and classes, youth teen sports programs, a pre-school program and teen leadership training during the summer months. The population of Mesa is mostly well-educated and employed people that favor the strong business economy and ample residential choices. Employers such as Mesa Public Schools District, Boeing, Banner Desert Medical Center and Empire Southwest/Caterpillar LLC help keep income levels high, with a median household income of more than $68,000. Residents of Mesa are typically involved in active lifestyles, enjoying a blend of work, school or play. Of course Golf is a huge activity, and 14 golf courses offer a lot of selection. The National Golf Foundation has given their seal of approval to the city-owned Dobson Ranch Golf Course as being a good deal considering the quality of the experience, based on the fees charged. Students in Mesa have a wide variety of schools to choose from, based on location of home if attending one of the schools in the Mesa Public Schools District system. There are 123 public elementary schools in Mesa, with the top-rated schools listed in GreatSchools.org. The Mesa Public Schools District also operates seven junior high schools and six senior high schools. Some students take advantage of the district’s Distance Learning Program, allowing them to take online courses from home from any town in Arizona. After graduating, some students finish their lower division college courses at Mesa Community College. Students interested in a variety of medical fields can apply locally at Pima Medical Institute. An abundance of healthcare options are available in Mesa, from Banner Desert Medical Center, a 459 bed facility, to the outpatient Southeast Veterans Affairs Healthcare Center. Another hospital facility, the 140 bed Mountain Vista Medical Center, recently received an award of Distinguished Hospital Clinical Excellence from HealthGrades.com. Mountain Vista Medical Center also has the only Level III Trauma Center in the East Valley. Mesa is fortunate to have freeway access from every direction, so traveling by motor vehicle to and from the city is simplified. For those that use public transportation, Valley Metro provides ample routes in and around Mesa, as well as daily routes to surrounding cities. The latest addition to the local public transportation scene is METRO Light Rail, the light rail system that goes from Phoenix one mile into Mesa city limits. It is also possible to fly into or out of Mesa at the Phoenix Mesa Gateway Airport, which provides services to and from various cities by Allegiant Air and Spirit Airways. The City of Mesa owns and operates Falcon Field, a municipal airport with no airline traffic. To work with a team experienced with listing and selling Mesa Residential Real Estate contact Tony & Suzanne today! Search for Mesa Area Real Estate Now!